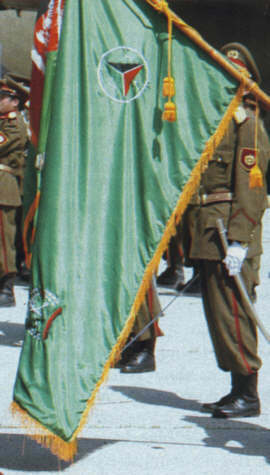 In the German news magazine Der Spiegel of 13 May 2002, p. 25, there is a photo of Afghan prime minister Karzai together with German chancellor Schröder inspecting the honour guard. This displays an obviously new army colour, which can be seen in this scan. Unfortunately only parts of the flag are unveiled. From what one can see, I assume the following pattern: green (silken) background with golden fringe and tassels, the national flag in the canton; some larger device (almost invisible) in the fly, two smaller devices in the lower hoist and lower fly, respectively. It looks like the colour has a canton displaying the national flag. The device centred near the hoist looks similar to the 1966 air force roundel black to the right, red to the bottom, and dark green to the left; set on a white circle, the points of the triangle not touching the circumference which possibly is also the current one. The Afghan roundel given in Cochrane and Elliott 1998 for 1967-1979 and 1995 onward, gives the roundel with the colours in a different order green to the right, black to the bottom and red to the left and with Arabic inscriptions in the white parts, but in the 1990's also without. Note that Cochrane and Elliott 1998 is not the most reliable source. Another possibility is that this is some sort of joint services color, with the national flag in the canton, the roundel symbolizing the air force in the lower hoist and the army bade in the lower fly. Antonio Martins asked whether the order of colours in the roundel could be a reverse/obverse phenomenon. I do not think so. Maybe if the roundel was mirrored, but it is rotated 120 degrees. I have seen in a newspaper Air and Cosmos of 12 April 2002 a photo of the only Afghan plane who still flies, roundel is red to bottom, black to front, green to aft.